Below is a demonstration ballot from the 1955 election. Note how it gives the residential address of each candidate. It also says which candidates are incumbents. Below is the outer part of an official ballot from the 1959 election. It was folded lengthwise, and the voter marked their preferences on the inside. Below is the inner part of the same. Worcester voters repealed PR on November 8, 1960, after Democrats in the Citizens’ Plan E Association (CEA) reversed their previously favorable position. CEA was a joint endorsement scheme of the regular Republican Party and self-styled reform Democrats who supported PR in 1947. It is interesting that the local AFL-CIO announced opposition to PR in December 1959. Massachusetts’ unions merged in 1958, and labor supported PR before then. Note that the CIO-affiliated Steelworkers ended PR in Cincinnati in 1957, partly at the behest of the national AFL-CIO Industrial Union Department. Each image is licensed under a Creative Commons Attribution-ShareAlike 4.0 International License. 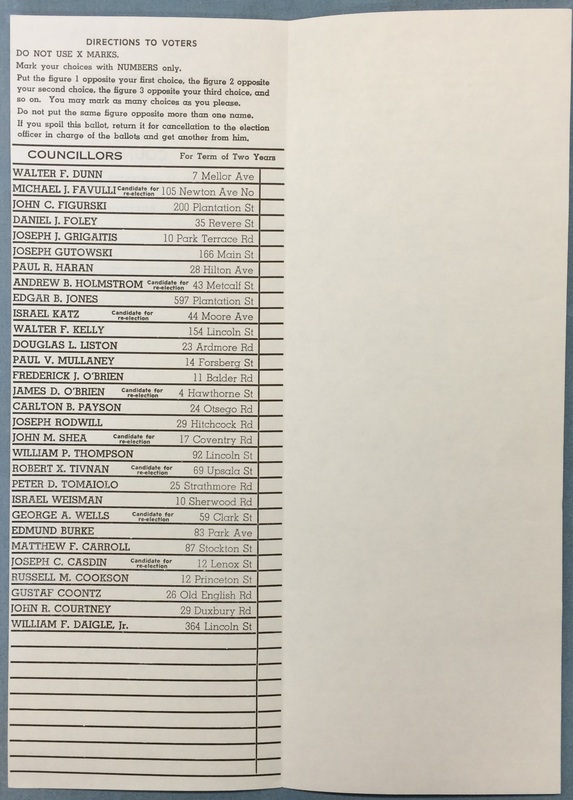 Is it surprising that street address and candidate for reelection appear on the ballot? In Massachusetts, both appear on all state and local ballots, except for US president. And perhaps it’s the street addresses that influenced the 1959 City Council election in Worcester. 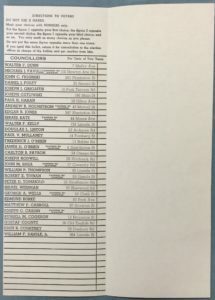 Two candidates shown on the ballot, incumbent Mike Favulli and Peter Tomaiolo, competed for the “East Side Italian-American seat” on the council; one or the other won that seat in 5 out of the 6 PR council elections. Favulli had won in 1957, but sometime over the next two years had moved to the West Side (Newton Avenue North!!). Tomaiolo, still an East-sider, was able to take the seat. Historical note: East side voters went strong for repeal in 1960, and promptly lost representation in the 9x at-large system that replaced it. Howie, thanks for this great context! Where are you getting the info? Local lore? Strictly with respect to the ballots, no, I’m not surprised about the addresses. Someone on Facebook recently posted a current MA absentee, and it looked eerily like these. But this is why I would love to see more ballots from the PR cases. What were they like in Ohio? How about Yonkers? New York City had partisan ballots, but they were organized by name, and party endorsements appeared under each candidate. I’d love to see one! Thanks. Favulli was a CEA Democrat 1956-9 (resulting from the 1955 and 1957 elections). He was a regular Democrat in 1954-5. I have neither Tomaiolo nor Favulli in the council of 1952-3. Tomaiolo served as regular Democrat in the first and last PR councils (1950-1, 1960-1). He’d been an Alderman in the pre-PR system. Let’s talk further. A general trend was the movement of regular Democrats into the CEA. Favulli begins this in the 1955 election. O’Brien continues it with the 1957 election. Archival records at WHM suggest a flood of regular Democrats into CEA in early 1955. Izzy Katz was CEA Democrat in 1952-3 and 1954-5. He loses in November 1955. He comes back as a regular Democrat in the elections of 1957 and 1959. Previous Previous post: Painful vote counts under RCV?